The final stage of the PNAC-like plan to destroy the Middle East is in full swing. “[T]he following is not an alarmist article. The public has no idea how strong IS is or is not in the Persian Gulf. Hell, even regional governments may not know. Of course the unnamed author of this “piece” ought to know because more likely than not, they’re aligned with the people planning it – a good reason to omit your name [red flag #2]. The final stage is now in full swing, Saudi Arabia is in the cross-hairs and, according to the RAND presentation’s slides, Egypt is likely next. I appreciate the link! Anyway, I’m the author of this piece; I’d like to clear a few things up. All of the information I got was from public sources, including the Islamic State expansion map. 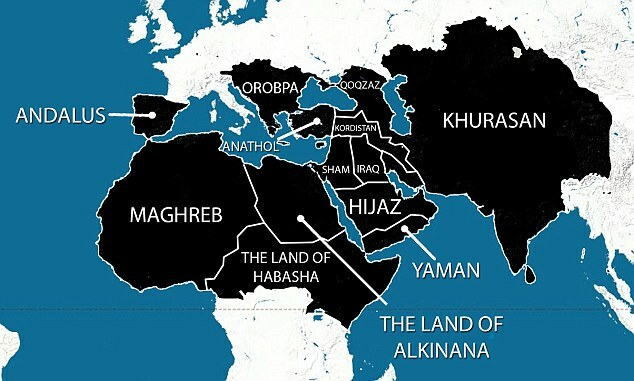 (I didn’t realize my particular source there was an Islamophobe, but an Arabic version of that map has appeared in Dabiq, Islamic State’s own published online magazine, and quite frankly I’d rather not link to them). Much like Mein Kemph, Islamic State doesn’t make any secret of its grand world design as illustrated by that map. As for my anonymity, a few clicks on the site and you’d have found out everything there is to know about me. I’m a freelancer writer in New York City with extensive experience in the Persian Gulf; my education emphasized modern Middle Eastern politics and history. (Just to help out, here’s my Contently page that describes much of my work: https://ryanbohl.contently.com/). I’m definitely not deliberately planting misinformation in an attempt to stir up war or carry out someone’s grand design; I’m trying to analyze publicly known events and provide a geopolitical lens in order to bridge misunderstandings about foreign affairs. Recently, a suicide bombing in Kuwait shocked the Persian Gulf, and to many it seemed like slaughter for slaughter’s sake. That is not the case; it’s a geopolitically understandable strategy for Islamic State expansion. Outgunned, IS must fight asymmetrically against its key enemies. al-Qaeda in Iraq successfully divided up Iraq to the point where its successor, IS, now rules half the country. They will now try to do the same to the Persian Gulf. Once more, I’m not working for anyone but myself. This information is all public; my slant is towards an amoral geopolitical description of the world. Even before the rise of IS, Saudi Arabia’s government was in deep trouble, and its allies don’t have the power to save the monarchy. Only hard reform within the kingdom can save the House of Saud, but given my experiences working within the Emirati government, it seems deeply unlikely they’re ready to do any of that. Please do respond! I very much create this work to create understanding and not to sow misinformation or conspiracy. Well I’m certainly glad you gave the pingback then! If you’re in NYC, do reach out after Ramadan! I’m always open to new conversations and coffee!